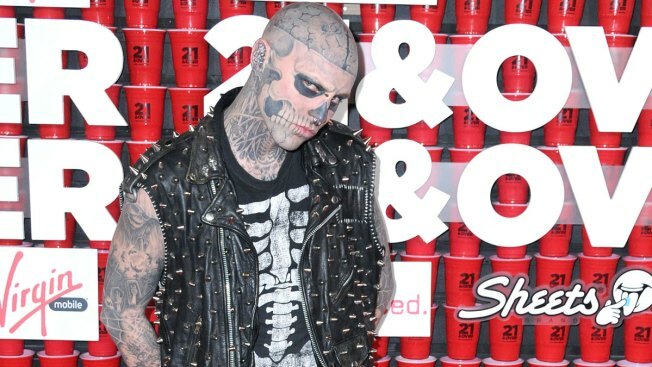 Lady Gaga is grieving the sudden death of her friend and muse, Rick "Zombie Boy" Genest. According to reports, the Canadian model died from an apparent suicide at the age of 32. Authorities told iHeartRadio Canada his body was found Wednesday at his apartment in Montreal. Genest, who was famous for his head-to-toe tattoos and living skeleton appearance, starred in the music video for Gaga's 2011 smash hit, "Born This Way." She took to Twitter with an emotional message about their relationship and the importance of mental health advocacy. "The suicide of friend Rick Genest, Zombie Boy is beyond devastating," the pop star wrote. "We have to work harder to change the culture, bring Mental Health to the forefront and erase the stigma that we can't talk about it." "If you are suffering, call a friend or family today. We must save each other," she continued. Alongside several black and white photographs from their time on set, Gaga shared in another tweet, "Science tells us that it takes 21 days to form a habit, if you are suffering from Mental Health issue I beckon for today to be your first day or a continuation of the work you've been doing. Reach out if you're in pain, and if you know someone who is, reach out to them too." Gaga also pledged her commitment to raising awareness for mental health issues, tweeting, "Kindness and mental health aren't one time practices. They aren't just to do list items. This fall, in partnership with @btwfoundation, I'll explore the power of habits to build cultures of kindness and wellness." First cast in a Thierry Mugler campaign, Genest forged a successful career in the modeling industry and appeared in magazines such as Vogue, GQ and Vanity Fair. He also became L'Oreal's first male spokesperson. The late star walked his last red carpet at the 2018 Canadian Arts and Fashion Awards in April.